TALHI memberships are organized by company or group. Insurance companies operating in Texas are invited to join as regular members. You will be asked to include your NAIC Company Code or NAIC Group Code on your membership application. If your company is part of a larger group of companies, each domestic and foreign life and/or health insurance companies organized or admitted and licensed to transact business in the state of Texas under Chapters 3, 11, 12, 13, 14, 15, 20 and 22 of the Texas Insurance Code within an applicant’s group system is also an applicant. Upon acceptance of the application, each company within an applicant’s group system becomes a regular member. Other companies that service the insurance industry are invited to join as associate members. Associate members include law firms, actuaries, CPA firms, asset management firms, other trade associations, and similar businesses. Associate members have the opportunity to sponsor events, have speaking roles at meetings when appropriate, network with potential clients, and receive pro bono advertising at the TALHI annual meeting. Any employee of a member company is eligible for discounted member registration rates at TALHI events, to register for members-only events, to have access to the Members Only section of the website, to receive member e-newsletters, and to take advantage of other membership benefits listed below. access to local counsel with extensive contacts at the Department of Insurance, the Governor’s office and the Texas Capitol. an opportunity to interact with Texas legislators through participation in TALHI’s biennial Lobby Day. a comprehensive summary of all important legislation passed during the legislative session which will have an impact the industry once implemented. 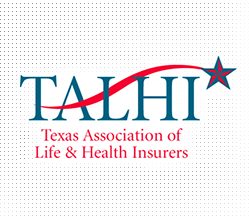 connection to Texas legislative leaders, Texas regulators, and other industry leaders at association events including TALHI’s annual conference. For more information about becoming a TALHI member, click here.